The closed world of open office environments. 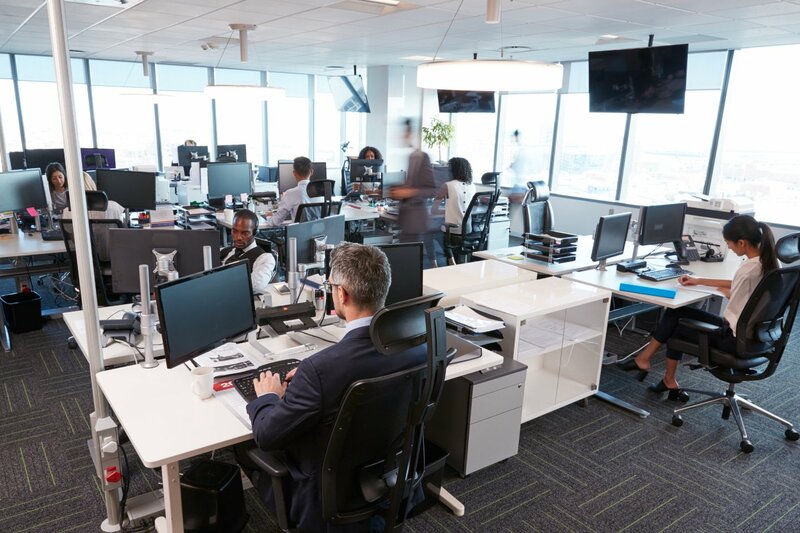 If you ask company managers and CFOs if they prefer “open office” concepts over private offices, you may well get a different answer than if you ask the people who actually work in open office environments. There are two attractive aspects about open office plans that surely warm the hearts of many business managers. One is the notion that an open office environment encourages more interaction and spontaneous collaboration among employees. The other is that open office concepts don’t cost as much to build and maintain as do private offices. So … let’s break this down a bit. Speaking personally, I’ve visited numerous company headquarters and branch locations where open office plans are prevalent … but what I see and hear isn’t interaction. Instead, it’s more likely to be mounds of white noise with employees sitting at their desks focusing intently on their computer screens. Any interaction that may be happening is closer to the hushed sounds of a reference library — or even the confessional zone in the back of a Roman Catholic or Anglican church — than it is to any kind of bright, casual conversation with ideation happening all over the place. This can’t be what managers had in mind – even if they’re shaving 25% or more off of their facilities management budget. Now we have some new evidence to support the anecdotal evidence. Researchers at the Harvard Business School studied two Fortune 500 companies that made the transition to an open office plan from one where workers had more privacy. The firms agreed to allow themselves to be the subjects of before/after evaluation. The research wasn’t done via a survey, which would likely be susceptible to respondent bias (a fear of being honest and saying something that goes against the common managerial POV). Instead, the actual worker behaviors were charted using “sociometric” electronic badges and microphones that were worn by the employees for several weeks before and after the office redesigns. The badges worn by the participants included an infrared sensor, a Bluetooth® sensor and an accelerometer that, when combined with a microphone, could discern when two people had a face-to-face interaction (but without recording the actual words spoken). The Harvard research also studied before/after data pertaining to the volume of e-mail and instant messenger use by the employees. The research also looked at shifts in interactions between specific pairs of work colleagues, where it found a similar dropoff in face-to-face communications along with increased electronic correspondence (although not to the same degree as the overall research results showed). Furthermore, the research determined that workers tended to interact with different groups of people online than they did in person, which opens up even more potential concerns about the reduction in collaboration that would be happening as a result of moving to the open office concept. In the case of preferred office configurations, people simply don’t like fishbowls. Deskside chats don’t happen, and other face-to-face interaction is severely limited as well. In other words, open office plans don’t result in increased personal interaction, but they do create a more digital environment. That seems like the polar opposite of what management wants. Of course, to reduce a company’s facilities budget, an open office environment remains the preferred thing to do. So maybe companies need to drop all of the pretense about “facilitating positive collaboration and spontaneous brainstorming.” Just tell employees what’s really behind shifting to an open office concept: spending fewer dollars. A detailed article summarizing the research, co-authored by Harvard researchers Ethan Bernstein and Stephen Turban, can be accessed here. As blogs, Facebook, Twitter, LinkedIn and other social media tools have moved into the mainstream in a big way, managers at many companies are responding with interest … as well as concern. On the “interest” side, social networking is seen as having great potential for enhancing relationships with customers and promoting brand affinity. But there’s also “concern” that social media has the potential to damage a company’s reputation through the dissemination of information that is unflattering, taken out of context, or simply wrong. Now, thanks to a July 2009 national survey of nearly 500 management, marketing and HR executives conducted by Minneapolis-based firms Russell Herder and Ethos Business Law, we have a more quantitative idea of the collective corporate thinking about pluses and minuses of social media. Four out of five respondents in the Russell Herder/Ethos field research believe that social media can help build a company’s brand. In addition, nearly 70% see social media as a viable employee recruitment tool, while two out of three recognize its potential as a customer service tool. But the survey also found that over 80% of respondents believe that social media poses a corporate security risk. Similarly, half of the respondents consider social media to be detrimental to employee productivity. These findings show that senior company managers are somewhat ambivalent about social media. They see its positive potential … but at what cost? On the other hand, is shutting the door on social media a wise response (or even a viable one)? One solution to this dilemma is to be found in dusting off an old standby – the employee handbook. In many companies, policies have evolved over the years to cover pretty much every kind of issue – from what constitutes approved and non-approved workplace activities, attendance policies, and conducting personal business during office hours to policies regarding alcohol consumption, gender/age/racial discrimination, and sexual harassment. Why not incorporate new guidelines outlining the company’s philosophy toward social media and what constitutes appropriate company-related social media activities on the part of employees? While it may also be a very good idea to conduct meetings or training sessions on social media as well, this a good first step that will give employees a sense of the “boundaries” they should observe when commenting on company-related issues in the social media realm. The alternative is a “Wild West” atmosphere in which a problem is destined to arise sooner rather than later. And when that occurs, if no formal social media policies are in place, the company will have no cause for defending itself in the court of public opinion – as well as little recourse for disciplining in addition to counseling the employees involved.